The Callaway XR Hybrid is aimed at the widest range of golfers, those seeking distance and forgiveness in all conditions. The CEO of Callaway is Chip Brewer, a keen product man. Prior to this, he was CEO of Adams Golf, who have a history of producing great hybrids. Now Callaway’s are on Adams’ heels becoming the Gold Medal Winner of the Golf Digest 2015 Hot List. The Callaway XR Hybrid features new and improved technology that makes the ball easier to hit, increasing ball speed and distance. 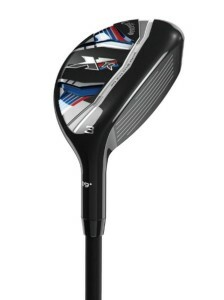 Callaway’s statement at release of the XR hybrid stated they are “built for outrageous speed”. The Callaway design team have raised the moment of inertia (MOI) rating by 8 percent and lowered the center of gravity (CG) by 46 percent as well as reconfiguring the club-head. This is what makes the hybrid forgiving, accurate and long in use. Matt black is the simple, business-like colour with a subtle, almost blended in, ‘V’ arrow on the crown. The red and blue on the sole gives the club a sporty look. The grooves on the face are wide. 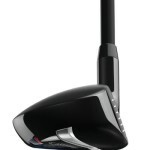 The head is very much bigger than the XJ Pro hybrid from Callaway, for the more experienced golfer. This is a meaty club, with the Callaway sound on impact. With such a large head, the ball seems to stay on the face a long time, but the feedback is good. The head-heavy weighting responds well to smooth, easy swings. The sound of the almost traditional Callaway ‘zing’ from the shaft is pleasant. The shafts are light which may be a struggle for better players who may suit the XR Pro version better. The XR hybrid is effortless in play. This makes it a good club to rescue you and get you back in play with reasonable distance. It is excellent in windy conditions with it’s low, driving trajectory. The shot it produces also goes higher and the ball lands more softly on the green with less roll-out. The XR very forgiving. It offers correction when you’re having an off day with thin hits, which this club corrects to good shots. It is also great out of the rough where fairway woods just can’t get the ball up and out. Also good for punching out from under trees and bushes. Callaway’s XR hybrid consistently adds 10+ yards than other clubs. It’s like you’ve put rock fuel in the golf balls. The variable face thickness that adds distance also generates an extra 2mph ball speed. The XR is a hybrid that offers increased distance. It has been suggested that it might be a better fit for someone looking to replace a 5-wood than a 5-iron. Try the XR hybrid on the next Callaways demonstration day, or visit their performance centres and fitting studios for a test drive.